The Band of The Brigade of Gurkhas is based at Shorncliffe near Folkestone. 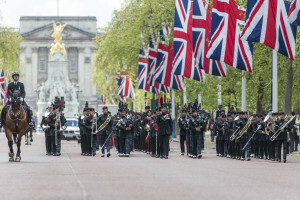 In the early days the Band travelled with the Regiment to other areas of India, Malta, Cyprus and Afghanistan. 1886 saw the raising of a 2nd Battalion which allowed for a further 16 Bandsmen and Naik and whenever possible these joined the already trained band, effectively forming one large band. As the 2 Battalions were often co-located this worked well enough but when separated the band would support each Battalion with a smaller group both musically and as stretcher bearers on operational duties. It has travelled extensively throughout the world. Australia, Brunei, Canada, South Korea and Malaya were visited in the 70’s and more recently Solomon Islands, The Falkland Islands, France, Canada, Korea, Germany, Cyprus, Belgium and Australia again in 1995. 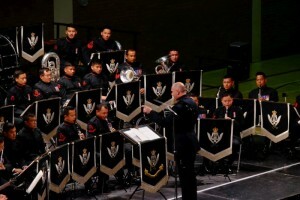 Today, musicians are recruited into the Band after their basic military training. Initial musical instruction then commences, first under the supervision of the Director of Music then after approximately four years, at the Royal Military School of Music. For more information please contact Capt Basudev Gurung on 01303225790.